Introducing the Three Piece "Valiko" Iron Bar Set! Created with a beautiful woven basket-like design throughout the center of the tabletop, the seats and chair backs. 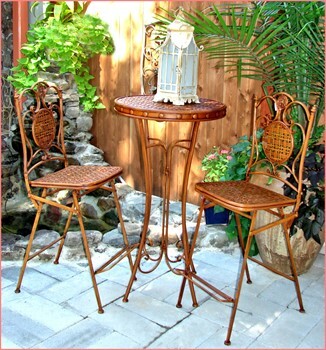 The increased height of this bistro set gives it that bar and stool feeling. It adds a whole new flavor to the atmosphere alone with dimension and style. Available in antique tanish/brown finish that coordinates with nearly everything, and still safe for both indoor and outdoor use. Both chairs and table easily fold for convenient storage. Despite the sturdiness of the set, each piece is lightweight and easy to move and safe for both indoor and outdoor use. Popular rental for prom, theater gala's and corporate functions, but also great for home use out on the front porch.